How often do you think of social presence (a feeling of being there and connected with others in a computer mediated communication) when designing and/or delivering your online course(s) or instruction? Does it even make sense to worry about it in the age of social media? According to community of inquiry model by Garrison, Anderson & Archer (2001), social presence is one of the three presences critical to online learning. The other two are cognitive and teacher presence. Despite the importance of social presence, and that fact that it is a driver of student persistence and satisfaction, most online courses have been designed without intentionally incorporating key aspects of social presence. It is disheartening that, even in the age of social media, with so many tools available, most online courses are as dry as they were a decade ago and suffer from the same challenges. “The challenge in online learning environments is facilitating some degree of interpersonal contact with the instructor and other participants” (Aragon, 2003 p. 59). This is not just superficial contact as if you are on the run, but rather a sense of genuinely feeling connected with and supported by others. This feeling helps liven online learning environments, thus making them more engaging and satiating to students. Whether you are an instructional designer, an instructor, or a student, just pause for a moment to think of your online course. As an instructional designer and/or instructor, does the design of your online course pass “the social presence test,” especially when you consider that learning is inherently a social endeavor, based on the strategies you have weaved into the design and delivery of your course? As a student, does your online course feel like you are socially present and together with others, sufficiently supported, adequately involved, and guided in your learning endeavor? While extensive research has been undertaken to explore and comprehend factors that foster, advance, and enhance student leaning and success in online learning, more is yet to be done. We especially need to understand how students respond to different aspects of online learning and how to effectively deploy and apply these aspects to enhance learning. This is particularly pertinent in STEM (Science, Technology, Engineering, Mathematics) and quantitative online courses, because those courses generally have higher attrition rates and require greater support. Research has also shown that the perception of students to these different aspects of online learning drives their motivation to learn (Smart & Cappel, 2006). 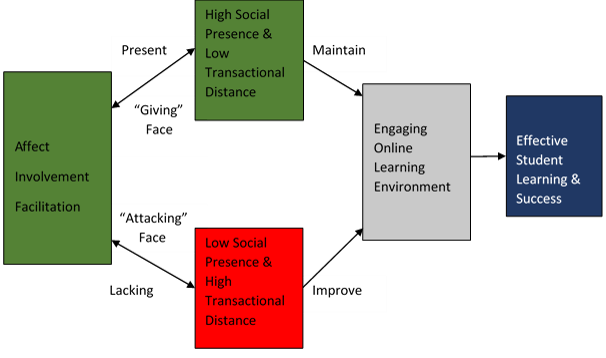 According to Chongwony (2008) giving “face” to students leads to higher social presence hence greater learning experience (see the model below). Learning is enhanced, for instance, through uptake of effective feedback. Students are likely to take in and use the feedback provided by peers and the instructor because they feel that they have an established relationship and all feedback provided to them is done so in their best interest. Demonstrating desired behavior among others. Ask yourself: Given the importance of social presence in online learning, what components of social presence are you incorporating in your courses? What tools are you using to foster social presence? It is prudent that institutions of higher learning and its instructors develop and foster strategies that enhance social presence. Aragon, S. R. (2003). Creating social presence in online learning environments. New Directions for Adult and Continuing Education, 2003(100), 57-68. Garrison, D. R., Anderson, T., & Archer, W. (2001). Critical thinking, cognitive presence, and computer conferencing in distance education. The American Journal of Distance Education, 15(1). Smart, K. L. & Cappel, J. J. (2006). Students’ perceptions of online learning: A comparative study. Journal of Information Technology Education, 5, 201-219. Dr. Chongwony has been a full time faculty member at Franklin University since 2008. During this time, Dr.